Woolwich 2000 by Carol Kenna & Steve Lobb. Mosaic Tiles. A beautiful mosaic celebrating the maritime past of Woolwich Dockyard. Unveiled by Nick Raynsford MP in June 2000, the Kingsman Green Mosaic adorns the entrance to the underpass connecting Kingsman Road and the Woolwich Dockyard Estate in South East London. 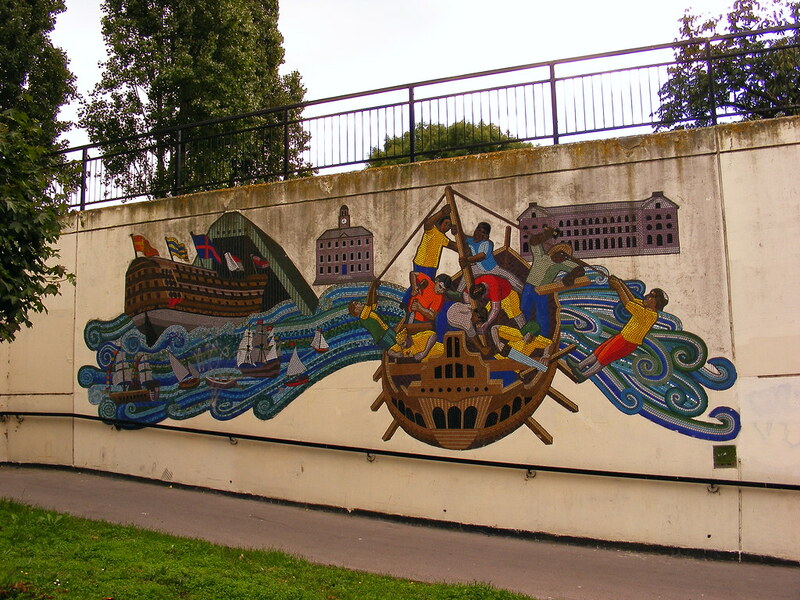 The piece was created by the renowned Greenwich Mural Workshop with the assistance of pupils of Cardwell Primary School and young people from the Woolwich YMCA and GD Youth Project . The mosaic shows the launching of HMS Trafalgar at Woolwich by Queen Victoria in 1841 and other scenes commemorating the areas long maritime history. It was funded by Greenwich Council, London Arts Board and the Foundation for Sports and the Arts. The mosaic is in good condition however there is much water staining on the surrounding area. From Woolwich Dockyard Rail Station, come out onto Belson Road. Take a left and walk down til you hit a T-junction. This is Kingsman Street. Take a left again and walk til you hit the main road. Then take a left again - you should see some shops and a subway ahead. This is Kingman Parade and the mosaic is in the Subway.